China’s fast-developing railways are forecast to reach a total length of 120,000 kilometers by 2020, with 18,000 km of them belonging to 200+ km/h high speed class, which will account for over half of the world’ high-speed railways by then. In the last few years, the construction of high-speed rails in China has reached its pinnacle, amid the increasing use of IT-based intelligent equipment and applications. Among them, the video-based monitoring systems have been prominent in improving China’s high-speed railway communications. Modern high-speed trains are driven by electrical power via an apparatus called a pantograph, which is mounted on the roof of trains to collect power through sliding contact with an overhead power line. Precise contact and supply of power to trains directly impacts the operation of the high-speed railway. However, as the pantographs are mounted on top of trains, it is difficult to monitor their condition, and they can be easily influenced or obstructed by environmental factors during operation. Incidents such as entanglement by trash bags or loss of contact with the overhead wires will produce shorting or failure in the pantograph-catenary electric transmission system. So, real time video monitoring of pantographs is an effective proactive method for discovering problems, allowing plenty of time for repairs and maintenance. Our customer is a first-tier manufacturer of railway cars and equipment in China, who now has gained nearly half of the high-speed locomotive assembly market. The installation of video-based monitoring systems on roofs of high-speed trains presented many challenges including the need for high-performance CPUs to support video monitoring operations, constant vibration, drastic temperature changes, as well as physical size and space restrictions on the trains. The system has to have excellent vibration-resistance, wide temperature support, and anti-jamming capabilities. To meet the requirements of video-based monitoring for high-speed rails, Advantech provided our customer with MIO-5272 3.5”single board computers (SBC), which offer high performance and low power consumption, allow fanless operation, and provides -40~85°C wide-range temperature support, delivering high reliability and ruggedness for long-term stable operation in harsh environments. 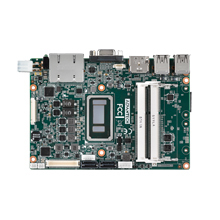 The Advantech MIO-5272 is a 3.5”small-sized SBC adopting the Intel CoreTM i ULT i7 processor, which provides high-performance computation with merely 15W of power consumption. MIO-5272 also provides rich I/O support, including COM, USB 3.0, 8-bit GPIO, mSATA, and more. USB 3.0 can be used for connecting line cameras or IP cameras. Meanwhile, the provision of MIOe high-speed expansion interface will allow users to flexibly expand interfaces for PCIe, SMBus, USB 2.0/3.0, LPC line-out, power supplies, or DP, all based on user needs. Advantech MIO-5272 is a high performance, highly reliable and flexible SBC product. The heat sink can automatically adjust and moderate the attachment force between the device and heating chips--such as CPU processor—to maintain a close contact for more effective heat transfer while avoid causing arcing of the host board. The Advantech-proprietary heat dissipation solution allows the use of smaller sized heat sinks delivering higher performance heat dissipation. If using the same size, the Advantech heat sink can lower more than 15°C of temperature compared with conventional heat sinks. Therefore, the Advantech host board, even when it is equipped with a CPU adopting Core i7-grade processor, can normally operate under -40~85°C temperatures for great long-term reliability. Good vibration-resistant capability allows for long-term reliable operation in the railway environment which is prone to shock and vibration. In addition to exclusive hardware designs, Advantech SBC products have complete embedded software built in, tailored to run on Windows Embedded Standard 7 OS, providing higher reliability than general embedded OS.